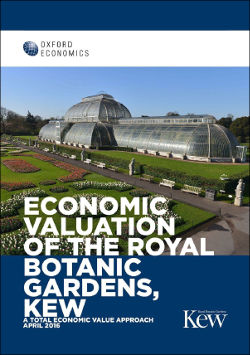 This study assesses the total economic value generated by the Royal Botanic Gardens (RBG), Kew. It considers a range of benefits, including the value accruing to visitors; the value attributed to Kew by non-users; educational benefits for visiting students; and productivity benefits which result from RBG Kew’s scientific research. We find that RBG generated a total of £182 million of economic value for the UK in 2014/15. A further £8 million of value accrues to international visitors and students. This valuation should be regarded as conservative since it does not incorporate some important areas of RBG Kew's work, such as the ‘insurance’ value and potential future economic value of species held in RBG Kew’s scientific collections; the benefits of increased planting activity encouraged amongst the wider UK population; and the international value of RBG Kew’s scientific research. The latter, in particular, could be very substantial, both because of the large contribution Kew makes to the infrastructure upon which large swathes of plant biology research around the world rely, and because much of RBG Kew’s conservation and other applied work primarily benefits other countries.